We have arrived at our second drilling location. How do we know? It is easy, just look at the change in scenery! (photo below) The sun came up earlier today, now that we have moved more to the east and the weather looks to be similar to yesterday’s – perfect! The drilling crew is busy stringing drill pipe together and we should bring some cores up on deck later today. The scientists will have more data to start analyzing. Today, I am going to highlight one of the scientists on board. Rick Murray grew up in Wellesley, MA where he attended public schools. He enjoyed being outdoors and going to the beach as he grew up so it is easy to see why he is here today sailing on his 5th cruise aboard the JOIDES Resolution. After high school, Rick went on to earn a BA in geology at Hamilton College in New York. This was followed by a year of graduate school at the University of Wisconsin, Madison, and followed up by a Ph.D. in geology from Berkeley. 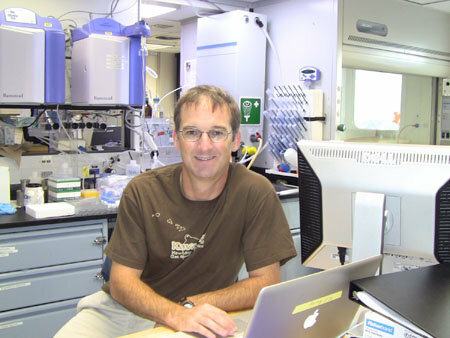 While an undergraduate, Rick also graduated from the Sea Education Association, Woods Hole, which lead him to the field of oceanography. He currently teaches earth and marine sciences at Boston University. His research interests focus on two areas. He looks at windblown dust that has settled on the seafloor. By analyzing the chemistry of the sediments, he can identify its source region. This is because different rocks have unique chemical signatures that can be identified in the seafloor sediments. Sediments on the seafloor provide information about climates in the earth’s past. His other area of interest connects him with microbiologists. Microbes break down minerals in the sediments. As sediment composition changes in response to climate changes, microbes beneath the seafloor may also change. So, the stratification of different types of microbes may be a response to changing sediments, which is a response to climate changes. Basically, Rick likes following the circuitous route of chemicals in the biogeochemical cycle. In his spare time, he enjoys sailing, reading, and playing with his children.